Join Us as a Research Assistant on a Scientific Dinosaur Dig No Experience Needed! We Will Train You, Camp With Researchers In The Remote Badlands, Under The "Big Sky" of Montana. Excavate Dinosaur Eggs and Embryos! Join Vickie Clouse, instructor of biology and paleontology at Montana State University - Northern, and the dinosaur research expedition staff in the opportunity of a lifetime! 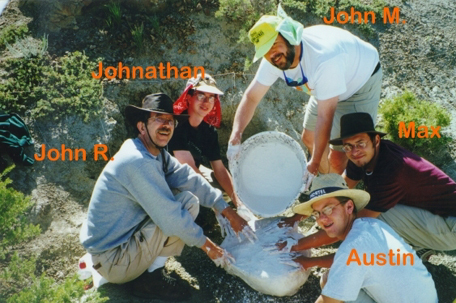 As a Research Assistant you will assist Researchers in the recovery of dinosaur eggs and embryos and other fossils in the badlands of Montana. Several nest localities have been found within this newly discovered 100 km dinosaur nesting ground. Up to 22 lambeosaur eggs, some with embryos, are preserved in 6 ft nests. (A lambosaur is a type of hadrosaur or "duck bill" dinosaur with a bony crest on top of its skull). Associated with these nests are the bones and teeth of many other ancient animals including crocodiles, turtles, mammals, birds, fish, amphibians, and many different types of adult & sub-adult dinosaurs. Paleontologists have stated that the Judith River Formation, (the group of ancient rocks that contains these nests) yields the highest diversity of dinosaurs on earth!